Relative Pro is a stylish, bright and eye-catching WordPress theme for business, e-commerce, blogging, and even capable of running a modern magazine related website and more. Start with a post slider, a custom front page template, 9 blog styles, and a whole lot more. What is also especially amazing about this theme is that if you don’t like the colours, you can use the built-in customizer to change the colours for almost every element that you see!. Having a website is a must if you’re planning to promote your business. 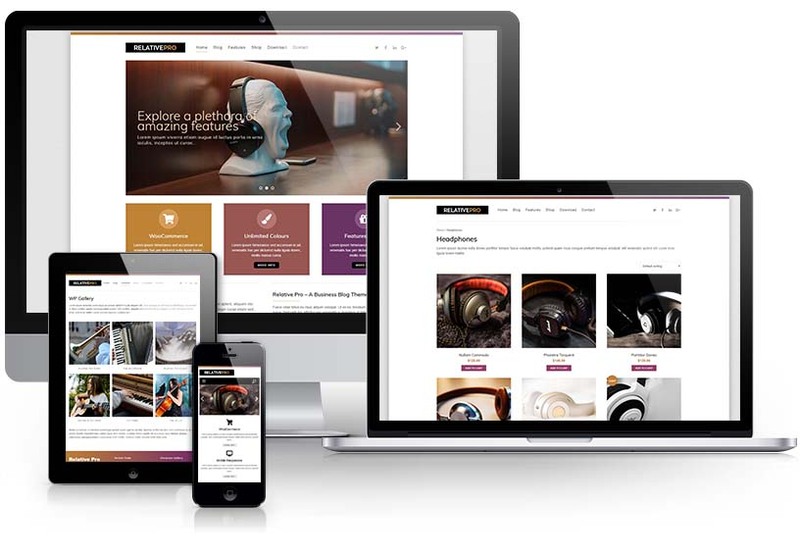 Relative Pro is going to be the solution for you by presenting a professional-looking and functional web presence with flexibility and overall good looks! If you are running or setting up an E-Commerce website, Relative Pro supports WooCommerce too. Relative Pro has also been redesigned with cleaner design, a lot more features like custom page header titles with a background image, the ability to now resize the slider with corresponding cropped images, or how about WooCommerce (if you install it) now has the ability to go from a full width store to a left or right sidebar layout! We’ve also added custom widgets for Author Info, Imagebox widget with overlay content, Iconboxes, and more! You have several purchase options to choose from that best works for you. For more details, check out the PRICING page. Here are several key features of the Relative Pro WordPress theme, but not limited to what it offers! You get up to 9 blog styled layouts to give you a ton of options to display your posts. With the built-in post slider, you can select a category and showcase a number of featured posts as slides. You get a theme that is WooCommerce compatible and ready for you to setup an online store to begin selling. Not only do you get 20 sidebar positions, but you also get dynamic width that self-adjusts. Categorize your posts with image, gallery, video, quote, aside, link, and audio post formats with linked tags. If you don't like the colours, you can easily change them with the built-in colour selectors and personalize it your way. Enjoy the option to go full width for your pages or choose one of several boxed layouts sizes. We added a social icon menu that is pre-styled for a variety of social networks that you can setup for followers. Add featured images to your blog posts with stylish captions that adds to the experience for your website visitors. Each blog style layout includes a option to enable automatic post featured thumbnail creation. This helps keep your blog consistent in style. Setting up a front page for a magazine or business, you get a custom front page template. Recent Posts with thumbnails, Author widget, Image boxes widget, and an Icon boxes widget. Import the live demo site content to get you started, including plugin recommendations that are used for it. We keep all themes up-to-date with bug fixes, adjustments, and even new features that get added. We make it a standard for all our themes that they can easily be viewable in a variety of mobile devices from phones, to tablets, all the way up to large desktop screens. To give you the flexibility of changing theme colours and setting up your options, the built-in WordPress Customizer gives you the flexibility to make changes. Every theme has sidebars, but what makes our themes different is the ability to have your widgets resize based on how many are published to a given sidebar group. Installing a theme is one thing but having detailed documentation with step-by-step instructions and screenshots is a great way to help you get started. Having a great theme is one thing but we strongly believe having great support is just as important.